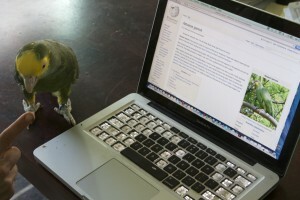 ← Parrot Behavior Myths: Is that a phase? Many animals have had their intelligence compared to humans to help us understand how they stack up next to others in smarts department. From this checklist, we might be able to get some hints regarding the origins of the relative psittacine intelligence. While some of these look applicable to some of our birds, a few are not possible for parrots to perform at all. Perhaps it is their ability to mimic human language, often taught to be used in context, that we are so fascinated by their intellect. But learning to use noises to achieve a desired result, like getting a grape, is very different than the beginnings of forming sentences and understanding the difference and function of each word. Even Dr. Irene Pepperberg’s extensive and fascinating studies with a single Congo African Grey, Alex, did not come close to achieving significant sentence formation or verb conjugation. It could be that because of these traits parrots suffer in our homes, and we so easily forget that they are not a person in feathered vesture. The reason it is so important to distinguish the intelligence of parrots from that of humans is to make sure that we treat parrots as a unique species, not as humans, and behave using a language they can understand. This article is written on the basic premise that each relationship between a bird and its owner is unique and therefore, must be observed in its particular environment. That said, the laws of behavior are universal across species, and how we find a reinforcing outcome for an individual is to observe its effect on future behavior, rather than assuming a value based on how we think a bird should feel about it. Below you will find a different sort of checklist, one where we briefly explore a few key areas that are crucial to analyze how we communicate with our bird with our actions. Disciplining your parrot for “naughty” behavior can damage your relationship. You can achieve a high standard of behavior with a few scientific tools in your belt. For many new parents and historically, owners of puppies, the most important thing we are told, is to teach our youngsters the term, “No!” Think of a toddler, with a hand reaching for an electrical outlet or a puppy grabbing on to a sock. “No” by itself doesn’t mean anything, especially to the puppy (or parrot) or even the dribbly ankle-biting toddler, for that matter. But paired with a corrective action to stop the offending behavior, perhaps a physical reprimand, as we have often been taught with puppies, and “No” could become an effective aversive itself. 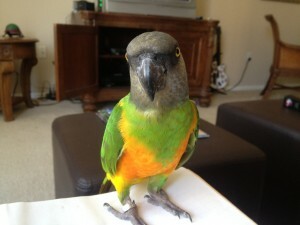 With that in mind, what exactly is happening when we as parrot owners use the cue “No” in an attempt to interrupt or curtail biting or screaming? Interrupting the problem behavior can be a powerful reinforcer for the human. In effect, we get the behavior to stop, even for a moment, which makes us continue to use that behavior in the future. We may not realize that because we have to keep providing the interruption in order to stop the behavior, saying “No” does not sustainably end the behavior but may in fact be reinforcing it by bringing our attention to the bird. A bird that learns its squawking or biting can bring about an immediate human response will continue to perform these behaviors. This can lead to frustration and thus, escalation, because we can’t understand why “No bite!” doesn’t work anymore. The above might be the best-case scenario. If, as mentioned earlier, we pair the reprimand with a corrective action that is common with other animals, the word “No” evolves from its neutral status, to being a cue that signals something unpleasant is going to happen. This creates anxiety, stress, and denigrates our relationship with our birds to one based on fear because they associate our presence with these powerfully negative actions. A rapidly building cascade of fallout behaviors can happen from one simple interaction. In this way, “No” can have the same effect as a raised hand poised to strike, a beep on an e-collar that indicates to a dog that shock is on its way, or a white lab coat associated with root canals and needles. Birds have unique brains, and while comparing their intelligence to humans is inaccurate, we can make comparisons to their maintenance levels to help us understand how much goes in to keeping them healthy and engaged. Instead of using the word “No,” try to think of how we can replace the problem behavior with a better behavior or prevent it from happening in the first place. Unlike humans, your pet does not have a moral code. He is not behaving to be naughty or nice. He is behaving to get what he wants, whether it’s chewing on toes or window fixtures, or screaming when left alone in a room. We can begin to effectively construct an environment that supports appropriate behavior by looking for ways to remove “No” from our vocabulary and focus on creating an environment that naturally encourages appropriate behaviors through stimulating appropriate behaviors at the appropriate time, which naturally replaces inappropriate behaviors. 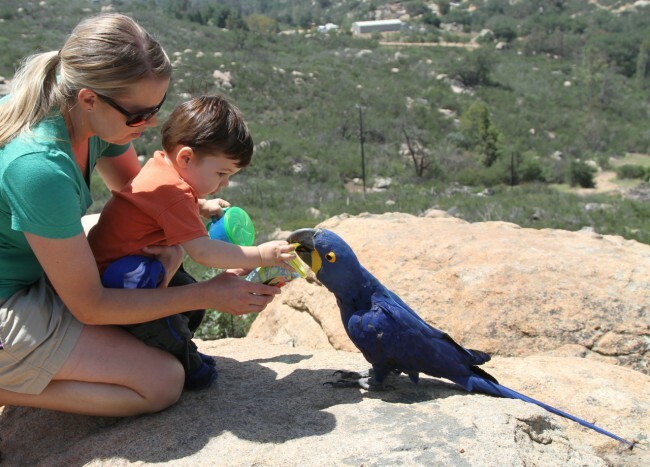 And who knows, in sharpening your observation and environmental arrangement skills with your birds, you might find some empowering parallels in the parenting and dog training world! This entry was posted in Problem Behaviors, Training. Bookmark the permalink.